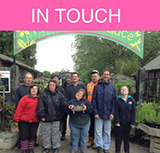 We are lucky at COT to have 6 unique social enterprises that bring in revenue for the charity whilst at the same time providing training and work placements. What really makes our enterprises unique are the people; everyone works together and plays their part in breaking down barriers and prejudice. So if you haven't already visited our enterprises come and see for yourself. We're sure you'll enjoy it. Please tell your friends. Every customer helps our charity do more great work!